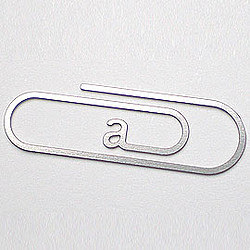 "In any case, here's something that super fab designer Stephen Reed showed us at 100% Design in London a couple months ago: Alphabetized paperclips. At first we were thinking: OK – and now what? But then when we started playing with them the genius dawned on us: Whether you want to organize certain things alphabetically or just want to prioritize – always a fun task - or turn your Moleskin into an alphabetized notebook. Or if you are into lists and want to have organized lists or if you just want to fool your fellow people and seem as if you are all organized. They are simply a lot of fun!" I already had this bookmarked so MAYBE I had already written a post about them. Who knows? !